Essentially a two-in-one deal, 2016 Leaf All-American Football Vault packages a pair of boxes into each Vault box. This includes an earlier U.S. Army box along with a bonus box of 2016 Leaf Metal All-American. The 2016 Leaf All-American Football Vault boxes feature one box from the recent past of the line. The various options are listed below and are linked to the full set details and checklist (when available) for each set. 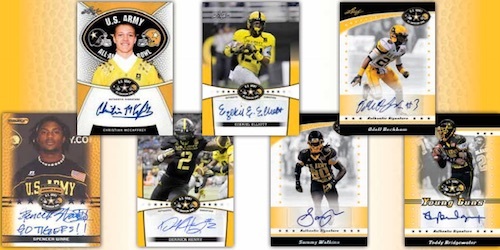 In addition to one of the randomly-inserted boxes listed above, 2016 Leaf All-American Football Vault also contains a bonus box of 2016 Leaf Metal U.S. Army All-American Bowl. The limited-edition box features a total of three hits with exclusive Metal Proof Autographs (1/1). Collectors can also find Blank Back Selection Tour Autographs (#/2), Freshman Class Memorabilia and Printing Plates Autographs (1/1). 2016 Leaf All-American Football Vault is limited to 79 cases or 948 total boxes. is there going to be a 2017 set ???? 2016 Leaf All-American Vault is an avant-garde product: not only is it a way for Leaf to move some of their leftover inventory,but it also gives the buyer two chances at big hits. I would have rated this a 5 star product, however of the two boxes I purchased, both contained a lower-end 2010 Razor box as the previous-release, suggesting that most what’s left in Leaf’s All-American vault are Razor products (although I was lucky enough to have pulled autos from Martavis Bryant and Cedric Ogbuehi, as well as a Robert Woods Game-Used card). What really makes this a special product is the 2016 bonus box (3-4 “super” hits). Overall, I would give this product 4.5 stars out of 5.